Regulatory reforms outlined by Timothy Geithner (NPR: Geithner Outlines Regulation Overhaul, 26 March 2009) now provides a template for all United Nations member countries. Consensus is building for collaborative fast track analysis, refinement and implementation for containment and stabilization of the global financial system. In the United States, the topic of insurance fraud, in the context of non-capitol based derivative instruments, is now a focus of legal action and recovery of taxpayer money paid to AIG counterparties. After AIG was rescued by the U.S. from collapse last year, banks that bought credit-default swaps got $22.4 billion in collateral and $27.1 billion in payments to retire the contracts, the insurer said earlier this month. Goldman Sachs, Deutsche Bank AG and Societe Generale SA were among the largest recipients. The letter asked whether holders received 100 cents on the dollar for their securities, a sum they wouldn’t be entitled to get unless their bonds actually defaulted. -- AIG Payments to Banks Should Be Probed, Lawmakers Say: Bloomberg, 26 march 2009. The role of credit agencies that facilitated the non-capitol based foundation of the shadow banking system, broadens the focus for legal containment of all non-capitol based over-the-counter derivatives ($684 Trillion: BIS Projection). A capitol foundation for all financial instruments is the foundation for systemic viability. 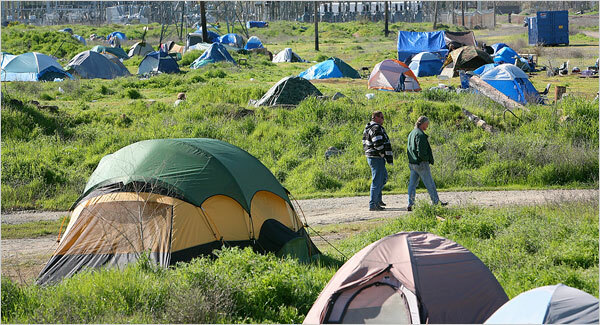 Residents of Sacramento’s Tent City to Move to Fairground: New York Times, 25 March 2009. Countries & Emergencies: All countries and territories. ReliefWeb. Economic Crisis Starts to Hit World's Poorest Countries: IMF Survey online, March 3, 2009. New York, NY – This weekend, continuing his visit to Latin America, President Bill Clinton traveled to Colombia to visit projects launched by the Clinton Giustra Sustainable Growth Initiative (CGSGI). In Cartegena, the former President toured a unique “inverse trade fair” organized by CGGSI that enabled 150 local suppliers of goods and services to forge relationships with six area hotels that currently purchase very little from local sources, but which have committed via CGSGI to purchase 20 percent of goods and services from local suppliers. In Barranquilla, President Clinton visited one of three community schools opened by the Pies Descalzos Foundation in which CGSGI is investing $2 million to support nutrition, vocational training, and income generation programs for two years. The school in Barranquilla serves more than 1,500 disadvantaged youth. In Medellín, President Clinton visited with the founder and workers of TANA, an organic spice business in the rural area of Quibdó that involves 150 Afro-Colombian women. CGSGI is supporting these women’s efforts to grow the business and identify new markets, and thereby advance the development of their community. President Clinton described this and other projects of the Clinton Foundation during a keynote discussion with Luis Moreno, president of the Inter-American Development Bank (IDB), at the IDB’s annual meeting. Building on his longstanding commitment to Latin America, CGSGI is a project of the Clinton Foundation that is working in Peru and Colombia – at the invitation of the national governments – to create jobs, increase incomes, and strengthen health, education, and other building blocks of productivity – all in ways that are locally sustainable. CGSGI is pursuing these objectives in partnership with the private sector, the Carlos Slim Foundation, local communities and NGOs, and other key stakeholders. The Clinton Global Initiative (CGI), another project of the Clinton Foundation, has made significant impact throughout Latin America. Through CGI, a diverse array of CEOs and world leaders have made 239 commitments affecting Latin America that are valued at more than $8 billion. Many of these commitments relate to poverty alleviation, climate change, and clean energy. The Clinton Climate Initiative (CCI) is working in Bogotá, Lima, and other cities in Latin America to improve energy efficiency and address climate change, with a focus on building retrofits, waste management, transportation systems, and outdoor lighting. The Clinton Giustra Sustainable Growth Initiative is an innovative partnership between the William J. Clinton Foundation, the private sector, governments, local communities, and other NGOs to increase the scope, scale, impact, and sustainability of social and economic development efforts in areas where poverty is widespread. Established in June 2007 by President Bill Clinton and Frank Giustra, CGSGI focuses on alleviating poverty in the developing world through market-driven development that creates jobs and increases incomes, and by strengthening factors that enable economic growth such as health and education. CGSGI is an effort to transform the way businesses do business in the developing world, by creating opportunities and models for all industries seeking to work responsibly in those regions. Established in 2005 by President Bill Clinton, the Clinton Global Initiative (CGI) convenes global leaders to devise and implement innovative solutions to some of the world’s most pressing challenges. Since 2005, CGI Annual Meetings have brought together more than 100 current and former heads of state, 14 Nobel Peace Prize laureates, hundreds of leading CEOs, heads of foundations and major philanthropists, directors of the most effective nongovernmental organizations, and prominent members of the media. These CGI members have made more than 1,300 commitments valued at $46 billion, which have already improved the lives of 200 million people in 150 countries. Commitments made at the 2008 Annual Meeting are expected to affect almost 160 million people. The CGI community also includes CGI University (CGI U), a forum to engage college students in global citizenship; CGI Asia; and MyCommitment.org, an online portal where anybody can make their own Commitment to Action. CGI will hold its Fifth Annual Meeting September 22-25, 2009, in New York City. For more information, visit www.clintonglobalinitiative.org. The William J. Clinton Foundation launched the Clinton Climate Initiative (CCI) to create and advance solutions to the core issues driving climate change. Working with governments and businesses around the world to tailor local solutions that are economically and environmentally sustainable, CCI focuses on three strategic program areas: increasing energy efficiency in cities, catalyzing the large-scale supply of clean energy, and working to measure and value the carbon absorbed by forests. In each of these programs, CCI uses a holistic approach to address the major sources of greenhouse gas emissions and the people, policies, and practices that impact them.